You don't have to fly to Iceland to see the Northern Lights. Just ask Shawn Malone. She's a photographer living in one of the northernmost parts of the continental United States, Michigan's Upper Peninsula. 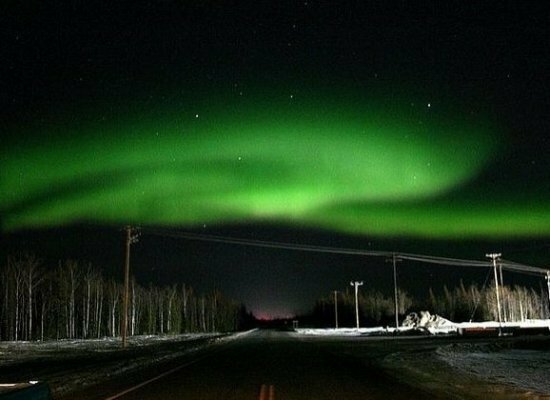 In a region where residents literally see the Northern Lights from their backyards, she has a knack for capturing dazzling images of these light displays. Marquette sky at night. Photo by Shawn Malone, Lake Superior Photo. Malone's new video, "Radiance," shows off her some of her most incredible Northern Lights images. She and other Upper Peninsula experts gave us their tips for heading north to Michigan's untamed wild to see them in person. The science behind these graceful visual marvels makes them even more spellbinding. The phenomena of aurora borealis, the Northern Lights, come from particles riding a solar wind reacting to our planet's atmosphere. When the sun's surface thins and pressure builds beneath, charged particles can burst out of the sun in a spurt called a coronal mass ejection. If the Earth lines up in the path of those particles, traveling at speeds of hundreds of thousands of miles per hour, they will be drawn to the Earth's magnetic poles. As those particles from the sun collide with Earth's atmosphere, they become excited, creating the light displays we see from way down here. 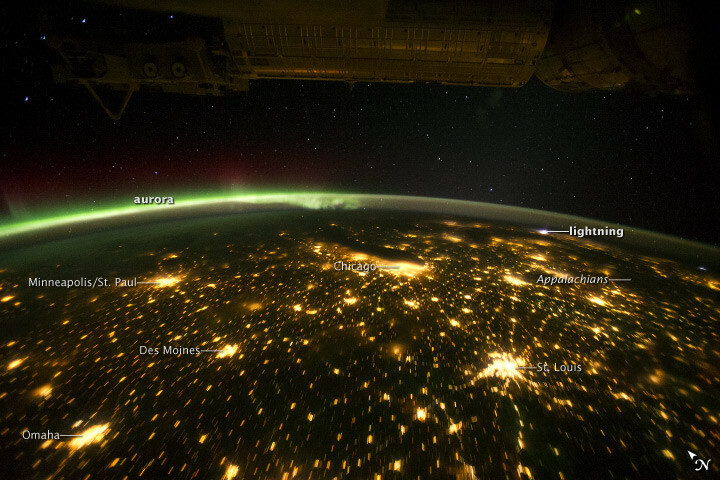 Aurora Borealis shot from space by NASA. Provided by the ISS Crew Earth Observations experiment and Image Science & Analysis Laboratory, Johnson Space Center. Understanding what the Northern Lights are will help you discover when the best times are to see them. The National Weather Service and NASA both monitor these flares, and Malone recommends reading Spaceweather.com to find out if the sun's activity forecasts aurora borealis sightings. She's photographed some of her most brilliant images during October, November and April. "It's before we start getting the lake effect snow, and you need clear skies to be able to see it. Those are some of the clearer months," she said. Photo by Shawn Malone, Lake Superior Photo. There's a general rule that the farther north you get, the better chance you have of seeing aurora borealis, says Justin Sailor, founder of the Upper Peninsula lifestyle brand Yooper Steez. "The biggest challenge is [finding] a clear night, but if you can make it to Lake Superior where it reflects off the water, that's a sight," he told The Huffington Post. 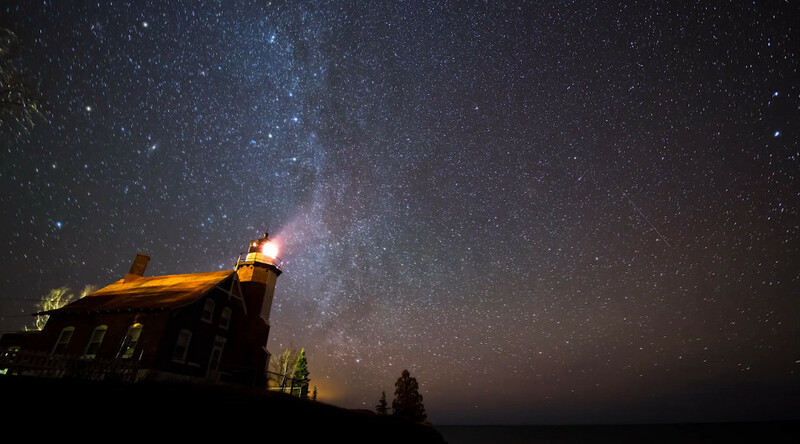 Our guides pointed us to two UP locations known for the best star-gazing and Northern Lights-watching -- Marquette, the major port on Lake Superior, and the Keweenaw Peninsula, the state's northernmost frontier. Below are their tips for navigating the Upper Peninsula on your starry-night searches. Among aurora geeks, the Keweenaw Peninsula is a favorite. Literally, the slogan for this western Upper Peninsula arm is, "Michigan's top of the world." Jesse Land runs Things to Do in the UP, an exhaustive chronicle of the peninsula's best hikes, hotels and must-sees. He told The Huffington Post first-time travelers to the Keweenaw should expect to book a follow-up trip. "The Keweenaw is one of those magical places you think you can see in a weekend and then years later, you're still going back and discovering new things," Land said. McClain State Park also has Lake Superior coastline for viewing the borealis, along with popular biking and hiking trails and a campground. 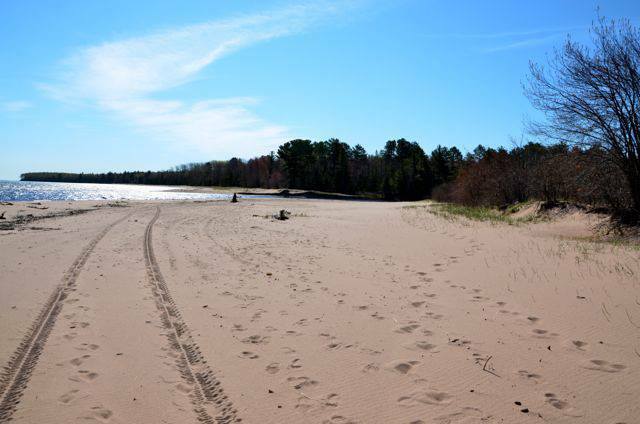 Bete Grise Beach, east of Lac La Belle, has three miles of sand that squeaks when it's walked upon. Eagle Harbor and Copper Harbor, where hiking-friendly Brockaway Mountain is located, are both scenic vistas on the Lake Superior coastline with innumerable photographic opportunities. Michigan is known for its fall color tours when the leaves change in autumn. The drive along US-26 and US-41 through the Keweenaw is one of the Upper Peninsula's most spellbinding fall secrets. Sturgeon Gorge. Flickr photo by emperly3. Quincy Mine Hoist Association: When copper was discovered in the Keweenaw Peninsula, miners flocked to the area for jobs. Although the mining company closed for good in 1945, the historic buildings and mine shafts are now a national historic landmark. Tourists can take a guided tram car a half-mile through a hill to the No. 5 mine shaft. Boston Trail, near Quincy Mine. Flickr photo via emperley3. Gay Bar: Yes, even the Upper Peninsula has a gay bar. Originally named after mining director Joseph E. Gay, it's been serving spirits ever since Prohibition. There's plenty of Gay Bar memorabilia, plus Keweenaw Brewing Co. beers and a notable cheeseburger. Sheridan on the Lake Bed & Breakfast: This contemporary log cabin is perched on Portage Lake, located at the gateway to the Keweenaw Peninsula. All three rooms have private decks -- perfect for enjoying a sunrise coffee as you search for soaring eagles on the horizon. Photo via Sheridan on the Lake Bed & Breakfast. Keweenaw Mountain Lodge: This forest getaway has eight motel rooms and 24 cabins (all with their own fireplaces!) for travelers. Spring for a deluxe cabin with whirlpool tub to chase away the winter chill. Eagle River Inn and Fitzgerald's restaurant: Travel blogger Jesse Land calls it "a destination all on its own." Locals just call it "The Fitz." While the hotel itself exudes mid-century charm, travelers will find spare, modern guest rooms, jaw-dropping lake views and, according to Land, one of the only beachfront restaurants on Lake Superior. Photo of the aurora borealis shot by Shawn Malone, Lake Superior Photo. Malone takes her amazing photos and video of the aurora borealis in Marquette, with incredible public access beaches on Lake Superior. With just over 20,000 people, it's the most-populated city on the peninsula. But the lack of light pollution and coastal location are perfect for Northern Lights seekers who want more vacation amenities and dining options. She said becoming an "aurora junkie," as she calls herself, is a slippery slope. "My first thrill was seeing my first Northern Lights photo come back after it was developed, because you have no idea how it's going to turn out," she remembered. "And once you have that experience, you pretty much become hooked." The M-28 highway, which snakes along Marquette's coastline, has several public turnoffs for stargazers to park. You can also perch atop one of the rugged cliffs of Little Presque Isle Park. The park is popular with tourists and locals alike in the daytime hours. For the more rugged adventurer, try the truly majestic Hiawatha National Forest's Superior coastline or Pictured Rocks National Lakeshore, located about 60 miles east of the city. Presque Isle park in the Upper Peninsula of Michigan. Photo via Getty Images. Sugarloaf Mountain: Seven miles north of Marquette, this short-but-steep 3,200 foot climb leads to three observation deck with incredible views. Blogger Justin Land writes that your camera is a must-bring accessory, especially during autumn, when the fall colors are most spectacular. "One observation deck has a great view of Lake Superior and Presque Isle Park," he recommended on his blog. "Another deck faces a little more toward Marquette and offers a good view of the Superior Dome, and the third deck faces away from the lake and toward Hogback Mountain." Flickr photo of Sugarloaf Mountain by eoz_15. Lagniappe: Down-home Creole cooking sounds a bit out-of-place in Michigan's Upper Peninsula, but locals swear by this basement Cajun eatery in downtown Marquette that offers all the tastes of N'Awlins, albeit 1,155 miles north of the French Quarter. The restaurant sells over 120 brands of hot sauce in the Gris-Gris Specialty Shop upstairs; the Voodoo Bar inside Lagniappe pours craft cocktails and martinis. Downtown Marquette has three breweries for beer-lovers to choose from. Try the smoked beer in-season at Blackrock's Brewery, or a Belgian IPA from Ore Dock Brewing Co. The historic Vierling restaurant also brews its own beer. Mouth of the Huron: The blog Some Yooper Beach reviewed 63 Upper Peninsula stretches of sand and named the Mouth of the Huron, a two-hour drive from Marquette, the overall winner. It's where the Huron River flows into Lake Superior. The two-mile sandy beach is one of the best swimming locations on the entire peninsula. "If the mouth of the Huron River were anywhere near Los Angeles it would be the “go to” movie set anytime Hollywood needed a stunning wilderness beach for their newest blockbuster," blogger Jesse Land writes. "Lucky for us, LA is over two thousand miles away." Travelers often book a room at one of the many national hotel chains in town. Here are three unique accommodation options in the area. Landmark Inn: This classic hotel in downtown Marquette has hosted Aretha Franklin, the Rolling Stones and even Amelia Earhart. Inside, Capers Restaurant offers a seasonal menu with locavore dishes; the Northland Pub is furnished like an old-fashioned English tavern; the North Star Lounge, boasting incredible shoreline views from the top floor, is reason enough to visit. Big Bay Point Lighthouse Bed & Breakfast: Each of the seven rooms are named after former keepers and assistants of the Big Bay Point lighthouse, which has been guiding mariners along the rocky Michigan coastline for more than a century. Guests have seen the aurora borealis from their bedrooms at night; around sunrise, sightings of deer, raccoons, rabbits, foxes and wild turkey are known to roam the neighboring meadow. Photo via Big Bay Lighthouse Bed & Breakfast, Big Bay. Birchmont Motel: The room rates of this family-owned 1960s-era motel, located three miles from downtown Marquette, are just as retro as the decor. It may not be the Ritz, but budget-conscious star-seekers can't beat the Lake Superior coastline views. Happy stargazing! Have you seen the Northern Lights? Leave us your tips for scouting the aurora borealis below.